Fulgurite or “petrified lightning” is what happens when sand is hit by lightning- the temperature is so hot that the sand melts. It fuses as it cools, usually into a tubular shape. I was gratified to find one at the Fairy Festival in Perth this year, as I know they are powerful manifestation tools. Some say the tube is a direct connection with the Divine. Ground yourself and breathe deeply. Become aware of your pranic tube (like a fluorescent tube around your spine). Pull energy or light up from your tailbone while simultaneously pulling energy down from your crown. Intend for these energies to meet at your throat chakra (concerned with your will). This is a way of accessing the 5th dimension- a powerful place to manifest. So much so that you must keep focused here, don’t let any negative thoughts in. As the energies mingle at your throat, hold the fulgurite up to your throat, the largest opening facing the throat. Picture clearly what you want to manifest. Draw a big breath in, and then force it out quickly. 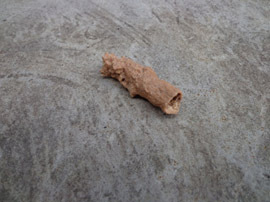 This pushes the intention through the fulgurite and out into the universe. I intended success with my novel- that it travel throughout the world. Clairvoyantly, I saw the novel fly high into the sky and then float down by parachute. One parachute became millions, and they filled the sky, gracefully dropping to earth. Finely chop an onion and sauté in olive oil in a fry pan. 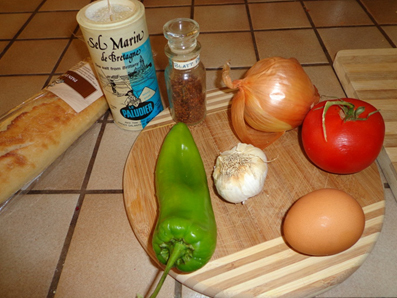 Then add one finely chopped long green pepper Or substitute ½ green pepper. Continuing stirring and frying. As it softens, mush it together with your utensil. Add one finely chopped ripe tomato. When it has become a soft mush and most of the liquid is cooked out, break an egg or two into it and quickly scramble. Season with salt and red pepper flakes (Blatt paprika). Or substitute with black pepper. As soon as the egg is cooked, it’s ready. Serve with crusty bread. 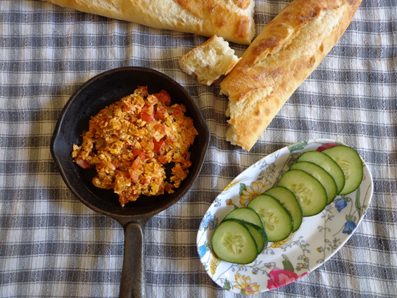 Use small ripped pieces of the bread to pick up a bite of menemen. 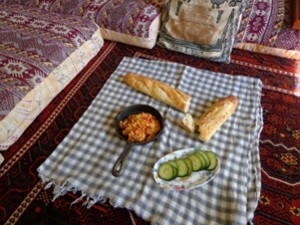 Anne has travelled throughout Europe and Morocco without paying for accommodation. She couch surfs! What a great way to travel! To learn more about couchsurfing watch this short interview where Anne claims “Couches are everywhere,” in a house that has no couch.